F�lix Arturo Lope de Vega y Carpio was a Spanish playwright and poet. He was one of the key figures in the Spanish Golden Century Baroque literature. 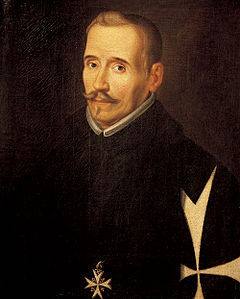 His reputation in the world of Spanish literature is second only to that of Cervantes, while the sheer volume of his literary output is unequalled, making him one of the most prolific authors in the history of literature. Nicknamed "The Phoenix of Wits" and "Monster of Nature" (because of the sheer volume of his work) by Miguel de Cervantes, Lope de Vega renewed the Spanish theatre at a time when it was starting to become a mass cultural phenomenon. He defined the key characteristics of it, and along with Calder�n de la Barca and Tirso de Molina, he took Spanish baroque theatre to its greater limits. Because of the insight, depth and ease of his plays, he is regarded among the best dramatists of Western literature, his plays still being represented worldwide. He was also one of the best lyric poets in the Spanish language, and author of various novels. Although not well known in the English-speaking world, his plays were presented in England as late as the 1660s, when diarist Samuel Pepys recorded having attended some adaptations and translations of them, although he omits mentioning the author. He is attributed some 3,000 sonnets, 3 novels, 4 novellas, 9 epic poems, and about 1,800 plays. Criticised for putting quantity ahead of quality, nevertheless at least 80 of his plays are considered masterpieces. A friend of writers Quevedo and Juan Ruiz de Alarc�n, the sheer volume of his lifework made him envied by not only contemporary authors such as Cervantes and G�ngora, but also by many others: for instance, Goethe once wished he had been able to produce such a vast and colourful work. All right, then, I'll say it; Dante makes me sick.